Soon after the attempt at making the difference engine crumbled, Babbage started designing a different, more complex machine called the Analytical Engine. 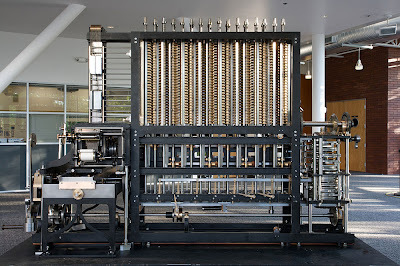 The main difference between the two engines is that the Analytical Engine could be programmed using punched cards. 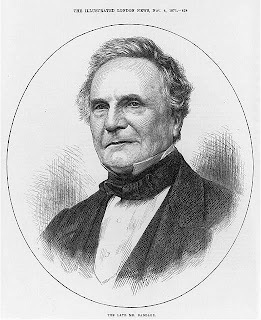 Through these inventions babbage tried to focus on the point that ‘Intelligence lies in the mind not in the crafting body ‘.The invention substituted the intellectual process by replacing the computers, human beings who use to do the exhaustive calculations manually , with engines . 'my right to dispose, as I will, of such inventions cannot be contested; it is more sacred in its nature than any hereditary or acquired property, for they are the absolute creations of my own mind'. As Andrew Zimmerman expresses Babbage's high estimation of the potential intelligence of machines rested on his view of a mechanistic universe, of presenting the universe as a machine that humans can construct and control using their minds. The human as self-interested calculating agent disappears from political economy and reappears as the more or less recalcitrant laborer who must be disciplined and integrated into an assemblage of machines. In their well-marketed texts, the factory guides emphasised that inside the automatic system tourists would see those 'admirable adaptations of human skill and intelligence' by which 'we are giving to the present age its peculiar and wonderful characteristic, namely, the triumph of mind over matter'. This triumph was at once a claim about the machine tool system, and thus the control of matter by human intelligence, and a claim about labour discipline, and thus the control of the work force by its masters. 'There is a tendency in the use of machinery to materialize the thoughts'. But in drawing a picture of the balance between the necessary division of labour and the combination of tasks required within the factory system, he insisted that 'such combination requires no small exercise of mind and no conceivable adaptation of wood and iron will produce a machine that can think'. The processes of automation and coordination which had spawned the factory system had made the problem of the place of intelligence urgent. Proponents of machinofacture reckoned that the factory system was evidently a consequence of intelligent reason and thus providential and virtuous. They situated this intelligence in the complex relation between the fixed capital of the steam-driven engines and the mental capital of the mill owners. The work force itself was only judged a producer of value to the extent that it matched precisely the capacities of the machines. The qualities attributed to this intelligence were just those required from this form of superintendence-anticipation and meticulous scrutiny. This was the definition of intelligence which Babbage embodied in his machines and the sense of intelligence which he reckoned those machines displayed. He even claimed that these were the virtues of divinity.